The TUBE-TECH Classic Channel – A Power combination! These three Classic TUBE-TECH units in combination give you a very powerfull tool for tailoring sound both when recording and mixing. You can also buy the Classic Channel as a plug-in. Get a good taste of what the classic channel is all about, check out The Classic Channel Plug-in by Softube. Due to the the skills of the Softube guys this plug in gives you an extremely good feeling of what the real thing does. 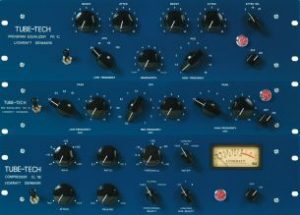 Softube also makes seperate plug-ins of the classic units: TUBE-TECH PE1C, ME1B and CL1B. The Softube TUBE-TECH plugs gives a very fine reproduction the hardware unit and in the plug-in world they represent the best quality possible today. But remember: Nothing beats the classics! If you aim absolute top sound quality, it has to be analogue TUBE-THCH.